And I should be getting 2 more android phones before the year end. I got a special job from a UK telecoms company, and to do the job I would be needing 4 android phones. Then there are other supporting devices I also have: 2 Spectranet internet devices, 1 Swift internet device... Soon electronic devices will form the bulk of all I own. Today, I will be talking about the one device that has helped me the most this year. And it's not my work laptop, though it's the one making me the most money. It is my iPhone and it is not only my most helpful device this year but my best buy this year. When iPhone 6 came out, people in the US began selling their iPhone 5 and 5S. They wanted to get more than what Apple will pay for those devices in their usual exchange/upgrade program. Especially those whose iPhones were still very new and could be sold for a much higher price. And that was the category the iPhone I bought fell under. The owner had just bought it 4 months before and he didn't really use the accessories (I guess he used those of his previous iPhone). The phone had no scratch as he used it with a specially tough case called A+Care. He took his time to write the biography of the phone with pictures of it. It was listed on Amazon Marketplace. And so for $409.95 I bought the iPhone 5 64GB, less than half the list price ($900). 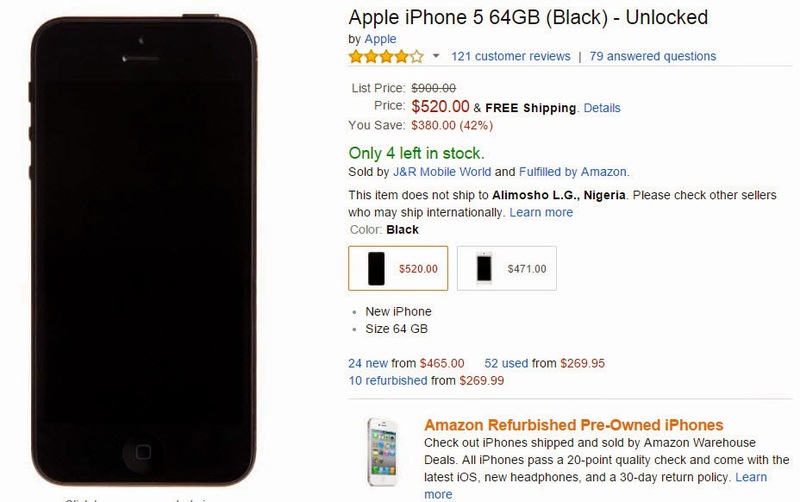 Even after paying for shipping it still was far cheaper than what I could get it for in Nigeria. It came at about N80,000 and it was new with a free high quality case. It came in its original box and with new looking accessories. Well so much for how it came, lets move on to how it has been unusually helpful to me. Unlike my android phone, it doesn't get hot and its battery life is almost 3x that of my Samsung Galaxy S2 phone. Then there are those apps that only exist for iPhones, and all the popular apps have a better iPhone version. I found Google's Chrome browser for iPhone better than the one for (same Google's) android. It's a pain using GTBank internet banking on the android's Chrome, the form fields keep jumping up and down, while it works perfect in Chrome for iPhone. So since getting the iPhone, I have not had to limit my phone activities trying to conserve battery like I used to with the android. With the 64GB space all my storage space worries were gone. And as the phone doesn't get hot, I get to use it more comfortably. And the result is that it has become my PA. I trade Forex on it; I scan documents at a quality better than that of my scanner at home; I read The Economist and Bloomberg Businessweek on it; I enjoy my Spotify premium subscription on it; I make Skype calls with it without fear of burning my ear; I stream internet radio via paid version of TuneIn Radio without worrying about battery life; I manage my PayPal transactions on it; the BBM on it is less buggy; I join webinars on it; I shop on Alibaba and eBay on it; I get discount codes for online stores on it; I read a lot on it: and I don't experience the speed/usability drop that happens with android as you install more apps. They are all small things and may be tasks of little value to you. But they form the bulk of what I do most days. I spend so much time in traffic that I have to get things done on my phone while in traffic and the iPhone does very well everything I need done. And that is why I have decided to name it my 2014 most helpful device.